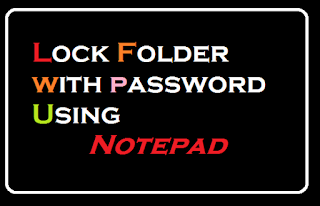 Home» Window » [Windows Trick] How to Lock a Folder with a password using Notepad? 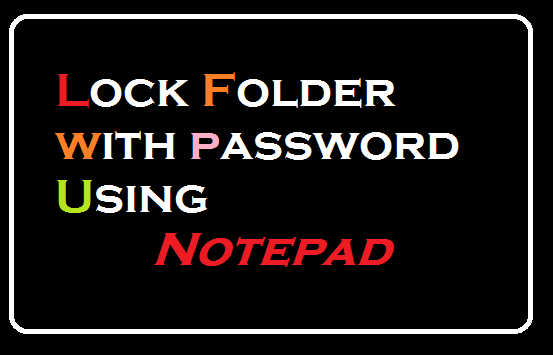 [Windows Trick] How to Lock a Folder with a password using Notepad? Today's Topic is How to Lock a Folder in Computer using notepad ? In such a case, if you want to have a simple Folder Lock on your computer / laptop, even in less time. So you have the right place. Because today I'm going to tell you the most awesome way to lock the folder. 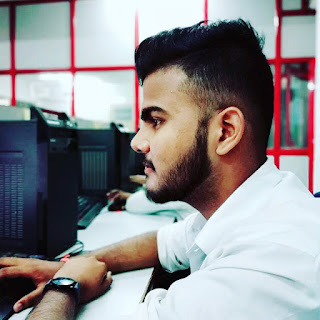 Neither does it require any programming language nor any software, just a little bit of basic information about computers. If you have any personal data in your computer, you can lock it with password using this trick. In the computer, there is a locker which is already named Bit Locker. But this does not lock any one folder. If you use Bit Locker you will have to lock at least one of your own drives on your computer. But here's what the trick is going to tell you, you can lock a file or folder with its help. Step1; First of all, when you open Notepad in your computer, press the Windows + R key and go to RUN command and type "Notepad" and click on OK.
Step2; Now after open the Notepad, copy the given code below, and paste it in Notepad. Step3; After copying the code into Notepad , Now you delete "Set your password" and type your password,and click on the Files option and then go to Save as and save the file from a .bat extension to a new folder. Step4; Now you go to the folder where you saved your .bat file. From here you first open once by clicking the .bat file, as if you open it once, a new folder named "Private" will be created. Whatever lock you do, you copy those files to Private Folder. Step5; After saving the files in the Private Folder, you will open the .bat file again. This time CMD will come in front of you and will ask you if you want to lock it. If yes then type "Y" and enter. As soon as you type Y, press Enter and the Private Folder will be hidden and locked. Step6; If you want to unlock it, then you have to click on .bat file then CMD will open, the password you entered there, type the password and press enter and your file will be unlocked.